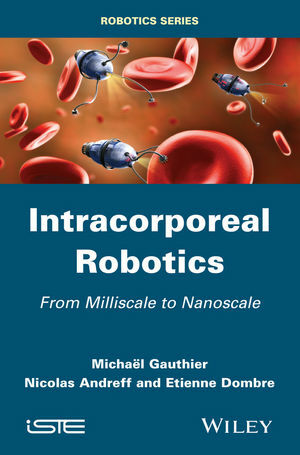 A promising long-term evolution of surgery relies on intracorporeal microrobotics. This book reviews the physical and methodological principles, and the scientific challenges to be tackled to design and control such robots. Three orders of magnitude will be considered, justified by the class of problems encountered and solutions implemented to manipulate objects and reach targets within the body: millimetric, sub-millimetric in the 10- 100 micrometer range, then in the 1-10 micrometer range. The most prominent devices and prototypes of the state of the art will be described to illustrate the benefit that can be expected for surgeons and patients. Future developments nanorobotics will also be discussed. Michaël Gauthier is a senior scientist at FEMTO-ST in Besançon, France. His research interests include the modeling of an object's behavior in the microscale (microworld), the study, modeling, and control of handling strategies dedicated to the microworld and the study of robotic microassembly of microcomponents about 1 to 100 micrometers in size. Nicolas Andreff is Professor at FEMTO-ST in Besançon, France. He is currently working on developing a research activity on medical microrobotics. Etienne Dombre is a senior scientist at LIRMM in Montpellier, France. His research interests include robot design and control and robotic systems for medical applications involving force control.